NSSLGlobal is now service ready for Iridium Certus, the new L-Band service from Iridium Communications Inc, as part of the Service Provider agreement the two companies signed in August 2018. This announcement translates to mean that maritime customers can get immediate access to the enterprise-grade global broadband functionality and voice capabilities offered by Iridium Certus — either as a standalone service or in conjunction with NSSLGlobal’s VSAT IP@SEA service. Enabled by Iridium NEXT, the company's next-generation $3 billion low orbit satellite constellation of 66 satellites, Iridium Certus ensures that crews at sea are safely connected and maintain consistent communication, regardless of location. It also offers a variety of speed classes with the initial service debuting at 352 Kbps and later upgradable via firmware to 704 Kbps in early 2019. 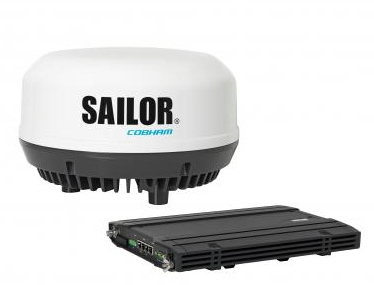 Working in tandem with NSSLGlobal’s VSAT IP@Sea, the Cobham SAILOR 4300 Iridium Certus terminal enables NSSLGlobal to provide customers continuous connectivity while also offering its unique Cruise Control+ solution. This will enable users to fully manage their operational and crew communications, via NSSLGlobal’s suite of value-added services, covering everything from crew entertainment, onboard IT management, cyber security to an integrated IP PBX. Scott McBride, the Group Sales Director at NSSLGlobal, commented that the demand for robust connectivity at sea is mission critical. Maritime companies are hungry for this next generation of satellite connectivity that will guarantee the speeds, consistency, and security they need to operate. Whether used as a standalone service or as a VSAT companion solution, Iridium Certus provides just that. They are service ready from all of the NSSLGlobal offices and able to provide SAILOR 4300 terminals for immediate shipment and service installation. To ensure optimum performance levels, their customers can quickly access the highest throughput at the best cost on the latest global network. It’s vital that they continue to add unique value to their customer providing quality of service, versatility and competitive choice in satellite communications. Bryan Hartin, Executive Vice President at Iridium added that the adoption of the Iridium Certus service by world-class specialist partners NSSLGlobal is a major milestone for the program. Not only does it allow us to reach a wider pool of potential users who will benefit from the service, NSSLGlobal’s customer base of land-mobile users, maritime and governments will benefit from the secure solution Iridium Certus provides connecting ‘on-the-move’ vehicles and assets anywhere on the planet along with a dual mode cost-efficiency capability that allows users to alternate between cellular and satellite connectivity. Iridium’s crosslinked satellite architecture enables real-time transit of data to and from any location on the globe without the need for abundant ground stations and allows it to maintain consistent coverage, including over the oceans and polar regions.